The last photo of Grant ever taken: July 20, 1885. 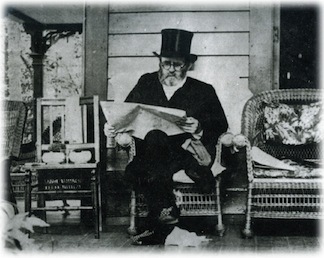 As Ulysses S. Grant’s throat cancer continued to eat away at him through the spring of 1885, he continued to struggle with pain of another sort, too. He was, at the time, in a race to complete his memoirs before the cancer struck him down, but his backwards glance wasn’t cast toward the Civil War only. He could not forget the events of the previous May that had nearly ruined him. His business partners, Ferdinand Ward and James Fish, had swindled him, leaving him and his entire family destitute. “No man-of-letters could more openly have worn his heart upon his sleeve,” Johnson said. Ward was eventually sentenced to ten years in New York’s Sing Sing prison, where he served six and a half years. James Fish, sent to the prison in Auburn, New York, served four years of seven. This entry was posted in Books & Authors, Leadership--Federal, Memory, Ties to the War and tagged Ferdinand Ward, Grant's Memoirs, Mark Twain, Robert Underwood Johnson, Ulysses S. Grant. Bookmark the permalink. Congrats on the new book! I will have to add it to my list for my study of General Grant and his family (scheduled for next year).